I realized today that there's an alien grey in my smartphone. There's probably one in yours, too. It is, of course, an 'emoticon' or 'emoji,' one of those annoying yet endearing little characters you can add to a text message or email to convey a certain feeling or attitude to an otherwise dull, vague or confusing message. When you're not sure if your words are getting the right message across, add a little alien face to let the person to whom you're writing better understand what's up with you. The alien grey emoji in my smartphone is a top secret alien acclimation project... And so is the one in your smartphone, too! Friendly, or evil? If you can't tell, then their plan is working. Think about it, fellow earthlings. 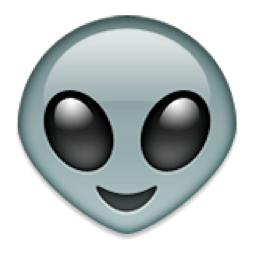 Every time we add an alien grey emoji to a text message, what are we doing? We're dropping our guard just a little. We're saying, "See, aliens aren't so scary! They don't mean us any harm." We're telling the person to whom we're writing that alien greys are fun and "cool" and so in tune with human emotions that they are now portraying one on your phone -- not mimicking one but representing one. Don't you see? We're unwittingly paving the way for an alien invasion! When they land in our parks and shopping malls and neighborhoods, we'll all welcome them with open arms, because we'll be expecting them to be friendly and smiling, because that's what we see every day on our phones. But the minute we welcome them into our homes, just before we try to tickle their 'chins,' out come the ray guns, and... well, let's just say that when the electromagnetic forces binding your molecules together are suddenly nullified, it ain't pretty. And it ain't the government doing this to us, folks. It's Sprint, and Verizon, and AT&T, and Vodaphone, and T-Mobile. And it's Google, and Apple, too. Reminds me of an old 1960's movie, a bizarre, intermittently funny black comedy called "The President's Analyst," in which it was ultimately revealed that the phone company ruled the world. Sure, it was intermittently funny then, but it turns out it's true. Only now we know that the phone companies that rule the world are in turn ruled by aliens. Which is even worse. Watch the texts! Keep watching the texts! And for God's sake, DELETE UNREAD!! See . . . just one more reason why I won't own a smartphone. > If you can't tell, then their plan is working. I think what is not working is the fear-mongering of the Hopkins-Jacobs-Strieber buffs. People have gone back to treating aliens as entertainment, not as a threat. So We Made Contact, Right? Looks Like it'll be Hillary in 2016!